This poke bowl uses all raw ingredients (no cooking!) to create a protein packed salad that’s fresh and ultimately satisfying. Thinking back on the time I spent in Maui over 10 years ago had me longing for this traditional dish. In Hawaii, you can find prepared poke in most convenience stores. It makes for a great snack to take on the go. Combine wasabi, ginger, vinegar, soy sauce, green onion and sesame seeds in a small jar and shake well. Add sesame oil and shake until combined. 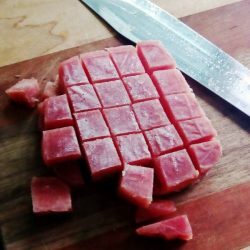 Cut frozen tuna steak into bite-sized cubes, starting by cutting the fillet lengthwise into two skinny filets. Then cut both horizontal sections into cubes. Place ahi tuna in a bowl, add the wasabi dressing and toss. Refrigerate for 30 – 90 minutes. While the tuna marinates, create the cucumber salad and avocado dressing. In a large bowl, mash avocado cubes with a fork or mortar and pestle. Add lime juice slowly to make a smooth base. Once combined, grate jalapeno into the bowl and mix. Stir in olive oil and add salt and pepper to taste. If needed, add water to desired consistency. Cut the cucumber using a spiralizer, julienne, or mandolin to create long strips. Sprinkle the cucumber with salt to release extra moisture, let sit 5 min and pat dry. Using a mandolin, cut the carrot and bell pepper into skinny, long strips. Toss veggies with the Salad Dressing. Divide the cucumber salad among two bowls and top with the Poke. Add sesame seeds and green onion to garnish. Like this Ahi Tuna Poke Bowl Recipe? Pin It!